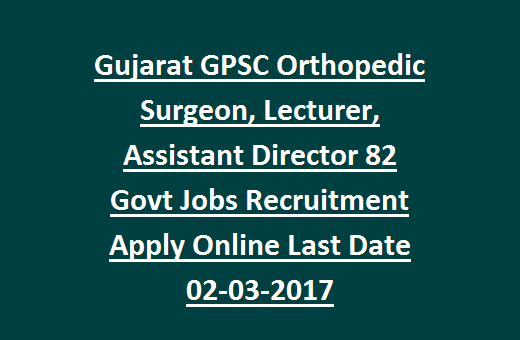 Gujarat GPSC Orthopedic Surgeon Jobs Recruitment 2017: Gujarat Public Service Commission GPSC invites online applications from eligible candidates for Deputy Director, Orthopedic Surgeon, Lecturer, Assistant Director, Deputy Industry Commissioner and Manager Jobs. There are total 82 vacancies available in this Gujarat PSC Recruitment 2017. 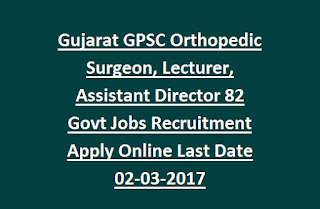 Interested/ Eligible candidates may apply for GPSC Orthopedic Surgeon Jobs through online using Gujarat PSC Official Website @https://ojas.gujarat.gov.in. Gujarat GPSC Commission will be held preliminary Exam and computer proficiency test to select candidates for the current vacancies. Online application process starts from 15- February- 2017 to 02- March- 2017.Other details regarding Selection process, Qualification details, online application process of GPSC Orthopedic Surgeon, Asst Director, Lecturer Recruitment 2017 are mentioned below. GPSC Online Application forms starting from: 15- 02- 2017. Last date to send GPSC online applications: 02- 03- 2017. GPSC Preliminary Exam date for Assistant Director, Deputy Director Jobs: 16- 04- 2017. Preliminary Exam date for Assistant Director (Physics), Manager Jobs: 07- 05- 2017. Exam date for Asst Director (Chemistry), Deputy Industry Commissioner Jobs: 21- 05- 2017. There are total 82 posts are going to fill through this GPSC Govt Jobs Recruitment 2017. 1. Deputy Director (Employees State Insurance Scheme): 02 posts. 2. Deputy Director (Tribal Development Department): 04 posts. 4. Orthopedic Surgeon: 48 posts. 5. Assistant Director (Physics): 01 post. 6. Assistant Director (Biology): 01 post. 7. Assistant Director (Chemistry): 04 posts. 8. Deputy Industry Commissioner: 06 posts. 9. Deputy Director (Archaeology and Museums): 03 posts. Candidates must have completed Degree with good academic records in relevant discipline from a recognized university. For more details see the official notification of Gujarat PSC. Candidate selection for Gujarat PSC recruitment vacancies is based on Preliminary Exam and computer proficiency test. Preliminary Exam will be conducted for 300 marks. Exam date for Deputy Director, Asst Director posts: 16- April- 2017. For Manager, Asst Director (Physics) posts: 07- May- 2017. For Deputy Industry Commissioner, Assistant Director (Chemistry) posts: 21- May- 2017. Candidates are advised to visit GPSC official notification for more details about the selection process, Admit card and exam dates. Interested candidates having eligible criteria may apply for these vacancies through online using Gujarat PSC Official Website @https://ojas.gujarat.gov.in/. Online registration process starts from 15- February- 2017 to 02- March- 2017. After successful submission take the printout copy for future reference.